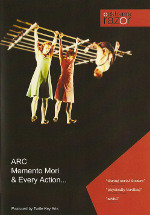 First performed as a trilogy in 2007 as part of the London International Mime Festival, ARC, Memento Mori and Every Action... have, in the UK at least, been three of the more influential pieces of contemporary circus from recent years. The version of ARC recorded here is fortunately about 18 months into the life of the piece, at a time when it had been revised and tightened. Played out on a grid of suspended scaffold – a raft – it's a classical study of three personalities wrung out by stress and restriction: a journey from fear to tenderness to envy to crisis to resolution – compressed and universalised. Memento Mori, a duet on a static trapeze-like frame, performed by Alex Harvey and Charlotte Mooney, saw the company become Jeunes Talents Cirque laureates in 2004. Directed by Deb Pope and based on The Dance of Death (a series of woodcuts by medieval artist Hans Holbein that shows Death leading emperors, cardinals, bishops, preachers, old men and women, merchants, seamen, pedlars, children, et al to the grave) it's a solemn and timeless evocation of youth and tragedy, completely unlike the company's other work. Abstract, cold, sepulchral – it sticks in the memory. Every Action... is perhaps the piece that is the least suited to recording – it's light-hearted material that feeds off a gathered audience, plus its tweedy Just William aesthetic of japes and summer pleasures feels a little too stilted here. It's visual language of trapezoids and V-lines is very clear on the long-shot, and the mechanics of the piece are perhaps laid a little barer in recording than when seen live – but, then, that's interesting in its way, and Every Action... is again notable as a piece performed on non-conventional equipment: this time a length of rope run over two pulleys so that the cast can explore counterweighting and balance. The trilogy is still in the Ockham's Razor repertoire, but at this point it seems to have more or less played out its life in the UK – making the DVD essential if you're interested in the company's history and work.